The Smartphone and Personal Digital Assistant (PDA) usage policy sets forth your company policy on usage of such devices in the workplace. Use this policy to outline approved devices, approved software, general usage, security, health and safety from overuse, proper conduct, etc. great and the support is top notch. I would suggest anyone who is self-employed pick this up for their business." This Smartphone and PDA Usage Policy is included in editable Word format that can be customized in Word or by using the included Wizard software. The purpose of this policy is to set forth a Company Smartphone and Personal Digital Assistant (PDA) Usage Policy by which employees and contractors will abide while using, leasing or otherwise making use of Personal Digital Assistant (PDA) devices. The intention of this policy is to provide proper guidance to employees and contractors who make use of PDAs during the course of their work with Company Name. As an employee or contractor of Company Name, you are required to comply with this policy at all times. For the purpose of this Smartphone and Personal Digital Assistant (PDA) Usage Policy, a PDA shall be defined as a hand-held computing device, tablet or phone ("smartphone") that provides Internet access (wireless or otherwise), software applications, communication and email services, and network connectivity through cellular, Wi-Max, Wi-Fi or other networks. Approved List of Devices (Hardware). Due to the changing nature of Smartphone and PDA devices, Company Name shall only support a limited number of hardware devices and configurations. This is done in order to provide employees with a high level of support while ensuring enough flexibility for employees to select the appropriate PDA that meets their job requirements. This approved list is subject to change and may be amended to adapt to specific Company needs and requirements. Approved List of Software and Technologies. In order to effectively interface with Company resources, networks, mail servers and other communication systems, the following software and technologies shall be required to be used for the following Company tasks. There shall be no exception to this list without prior written approval from IT Department, Manager, etc. Due to the changing nature of PDA devices, Company Name shall only support a limited number of hardware devices and configurations. This approved list is subject to change and may be amended to adapt to specific Company needs and requirements. Docking, "Hot Synch" or other Synchronization Systems. FTP / SFTP or SSH Access. Instant Messenger (IM) or Chat Programs. Employees may use PDAs that they own or lease, provided that they meet the above guidelines AND that they have written permission from IT Department, Manager, etc. Use of PDAs by Company employees and contractors shall be governed by the Company Internet Access and Asset Usage Policy as well as the Company Wireless Network Usage Policy. Copies of these policies may be obtained from the Company Human Resources Department. All PDAs provided to employees and contractors may not be used for commercial or other activities from which they, directly or indirectly, personally profit or have a profit motive. All PDAs must have the Company-required applications and security software installed prior to accessing Company resources or networks. Employees must have the Company IT Department review and certify that all PDAs meet the Company Network Security Policy prior to their use. All PDAs shall make use of access control systems and encryption. All PDAs and software running on PDAs must use complex passwords and secure digital certificates for remote access. All PDAs shall make use of self-updating or software that automatically updates itself to ensure that the devices comply with the Company Network Security Policy. All PDAs, whether owned by the employee or not, shall be subject to on-demand audits by the IT Department or Managers to ensure compliance with the Company Network Security Policy. All PDAs provided to employees and contractors must be serialized and recorded into Company Inventory. This includes all PDAs purchased by employees or contractors that they are later reimbursed for. Improper usage or overuse of PDAs can lead to injury, tendinitis or swelling of tissues and joints. The following is provided to help you avoid such injury while you use your PDA. If you have questions or concerns or would like a demonstration of these safety techniques, please contact the Human Resources Department. Taking frequent breaks from using your PDA. Immediately stopping use if you experience any of the following symptoms: pain in your thumb, fingers, wrist joints or anywhere else on your body. Immediately stopping use if your hands or extremities feel numb or are tingling. Avoiding typing for more than a few minutes at a time. Avoiding typing only with your thumb. Making sure that your wrists are in an upright position and not flexed or bent when typing. Try placing a support underneath your PDA whenever possible. Tap each finger with the thumb of the same hand. Alternate tapping the palm of your hand and the back of your hand against your thigh as quickly as you can. Open your hands and spread your fingers as far apart as possible. Hold for 10 seconds and repeat eight times. Fold your hands together, and turn your palms away from your body as you extend your arms forward. You should only feel a gentle stretch. Hold for 10 seconds and repeat eight times. Fold your hands together, turn your palms away from your body, and extend your arms overhead. You should feel the stretch in your upper torso and shoulders to hand. Hold for 10 seconds and repeat eight times. Responsibility and Storage of PDAs. Company employees and contractors accept responsibility for any loss or damage that may occur that is deemed by the Company to be excessive and beyond what would be consider normal wear and tear. The following guidelines have been provided to aid employees and contractors with the physical safety and responsible storage of their PDAs. PDAs should never be stored in a locked car, glove compartment, rooftop luggage system, trunk or in plain view in order to avoid theft and damage from severe temperature changes. Employees or contractors traveling by air must carry all PDAs onboard their flight with them. This is to prevent accident loss or theft of sensitive data from checked baggage as well as potential damage that may occur from storing the PDA in a non-pressurized environment. PDAs should never be put through the metal detectors at airport security screening checkpoints. Employees or contractors should be aware that they may be required to power-up their PDA at such checkpoints and failure to do so may result in the PDA being impounded or seized by Airport Security. To ensure compliance with Company policies, you should make sure that your PDA is sufficiently charged prior to traveling by air. Company reserves the right to add, modify, or delete any provision of this Agreement at any time and without notice. Company reserves the right to restrict any access right at any time, whether a violation of this Agreement occurs or not. Company reserves the exclusive right and will be the sole arbiter as to what constitutes a violation of any of these provisions. Failure to adhere to the policies and provisions of this Agreement may result in disciplinary actions and/or termination. Allowing access to any restricted information by individuals or purposefully allowing individuals to gain access to PDA for non-company or non-authorized activities. Allowing any dangerous or restricted software or application to be installed on the PDA at any time. Engaging in any behavior with PDA that would violate the Company Wireless Network Usage Policy or Company Internet Access and Asset Usage Policy. If Company becomes aware of an alleged violation of any of the terms contained in this Agreement, or any other policy that has been posted on its web site, made available to employees or contractors via email, or posted in any other form, Company shall initiate an investigation. During the investigation, Company may restrict access to the employee's PDA, whether personally owned or otherwise, in order to prevent further possible unauthorized activity. Company may, at its sole discretion, restrict, suspend, or remove employee's PDA without notice or refund, or pursue civil remedies as it deems necessary. Company shall notify the appropriate law enforcement department of any such violations. Company shall not be responsible for any payment, refunds, or compensation in any way for service disruptions or termination resulting from violations of this Agreement. 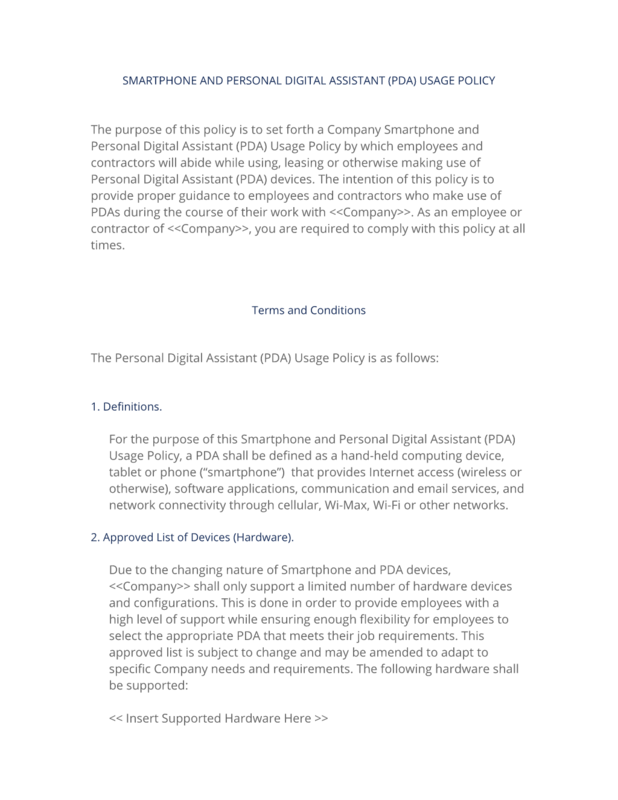 The complete Smartphone and PDA Usage Policy - with the actual formatting and layout - is available in this Contract Pack.